My folks are snow birds and spend most of the winter in South Florida. They've often spoken about a BBQ place that they like called Michelbob's. They've even brought me a jar of their rub, which I enjoyed. I reviewed their rub here. Well finally I had the chance to visit their place in Naples and eat at Michelbob's while we were there. Since my folks have eaten there, they've acquired a Big Green Egg and I've shown them a little bit about how to prepare ribs. I think they were surprised that the ribs weren't quite as good as they'd remembered. I have to agree with their revised opinion of the place and say that the ribs weren't all that great. The place is typical of mot BBQ joints. There's lots of vintage Coca-Cola hardware decorating the walls, the floors and walls are rustic, and the menu is pretty standard BBQ fare. There are several mentions in the lobby and on the menu to having "Championship Ribs" and of the restaurant being voted "Best in South Florida". 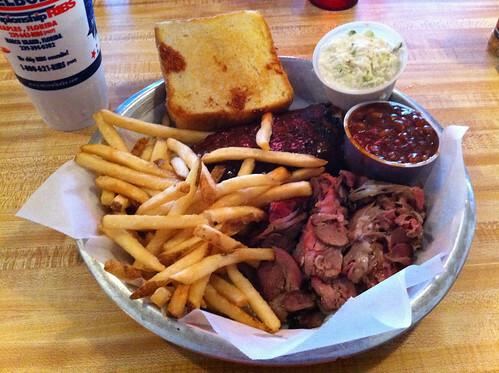 I didn't see any other BBQ joints in Naples or Marco Island, so the competition may not be too steep. I ordered a combo plate of ribs and BBQ beef. I found the ribs to be tender, but the only flavor came from the sauce. Frankly, I didn't much care for the sauce they served on the ribs or either the sweet or tangy sauces that were on the table. The beef was a very thinly sliced "beef roast" according to the waitress. I was disappointed in the amount of fat that was left on the roast. Either trim the beef before the you cook it or after, but don't serve me a bunch of fat. My wife tried the pork sandwich. Frankly, that was the most flavorful meat that any of us ordered. However, it was thinly sliced (rather than pulled) pork shoulder. It suffered from the same issues as the beef roast and was a little fattier than I'd have liked. Overall, I did enjoy the BBQ rub that I'd tried before. However, I wouldn't categorize Michelbob's as "championship" BBQ. In a pinch I'd order a pork sandwich but I'd pass on the ribs if I were to eat there again.